I came across this infographic from Wine Folley this morning and wanted to share, as I know many of us will (and probably have already been) indulging in wine during the holiday season. The infographic simply explains everything you need to know about wine, including everything from wine types, glasses and aromas, to tasting tips and types of foods to pair with each wine. Check out the infographic and tips below. And go ahead and enjoy a nice glass of your favorite wine this weekend – you deserve it! With over 1300 types of wine out there it’s better to start with just the basics. Discover the most popular high quality wine varieties – from Albariño to Zinfandel. 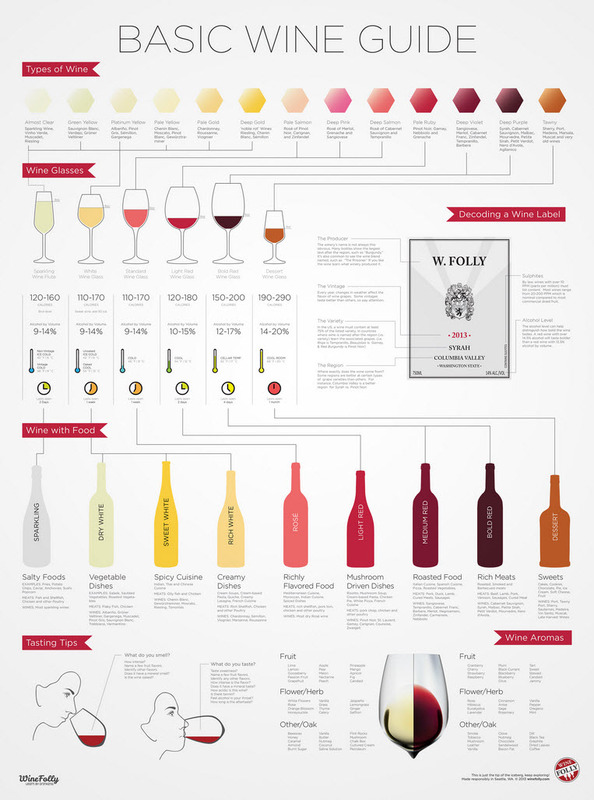 In the Wine for Beginners Chart , you’ll find them arranged by color. Which glass do you use for Pinot Noir, Cabernet Sauvignon and Chardonnay? You can discover every type of wine glass out there or just start off with a basic set. On US wine labels ‘Reserve’ doesn’t officially mean anything, but there are a few tips you can learn. For instance, the alcohol level says a lot about the style of wine and the vintage tells you a lot about the quality. Even though alcoholic beverages aren’t required to list calories, that doesn’t mean they are calorie-free! Learn the calories of wine by style including common wines like Pinot Gris, Pinot Noir, Cabernet Sauvignon and Moscato. We’ve illustrated wine and food pairings before, but the method above will inspire wine pairing with common dishes you might enjoy at home. It doesn’t matter what type of bottle you use (unless it’s for sparkling), however there are some standards in the business. Did you know that Pinot Noir, Syrah and Grenache are almost always bottled in a more feminine style low-shoulder bottle? Also, Cabernet Sauvignon and Merlot are nearly always bottled in a masculine high-shoulder bottle. These facts can help you identify what’s inside the bottle when the variety is not listed. Check out the video on tasting wine if you’d like to know how to taste like an expert. After you get past the ‘wine taste’, what else do you smell or taste in the glass? A handy list of common wine flavors may help you fill in the blank. What’s your favorite wine pairing? Let us know in the comments below!